Jordan Henderson's ricocheted second half goal was enough for Liverpool who saw off a spirited Swansea side; thus closing the gap on rivals Manchester United in the top four race. Swansea opened proceedings as a raucous Liberty Stadium fulled under the vibrant night lights; hosting a massive challenge against Liverpool who were on a terrific run of form prior to the game. A brief moment of madness saw Fabianski make mess of a cockeyed back-pass; rashly stretching a leg out on the byline to prevent a corner which unwillingly presented Sturridge with the ball at close range. The Englishman was closed down quickly and forced into settling for a corner kick. Excluding the early mistake; Swansea made a sharp start to proceedings as Taylor blistered down the left channel with real intent. Henderson rushed across and sent his charging opponent tumbling over with a poorly timed slide-tackle. Danger down the right channel slowly emerged as Gomis embarrassed Can with a swift nutmeg. The strike scampered into the area but Allen's terrific sliding-challenge prevented a dangerous situation for Liverpool. Rodgers' men offered very little offense in the opening 20 minutes as Swansea's energetic start and promising runs down the wings pinned them inside their own half for lengthy periods. When they did break forward, long shots were taken to try and catch Fabianski off guard, however to no avail as the Swansea man denied Lallana's stinging effort from 20 yards. In another well-sequenced attacking move, Gomis played a clever one-two with Routledge just outside the area before drilling a low, hard effort at goal. Mignolet got down well and stopped the ball with a solid glove. Taylor had been posing a threat down the left flank and continued his ways. Scampering forward with real intent, he crossed low to Sigurdsson who did well to hold off Allen, turn and curl a shot that only just blazed over Mignolet's bar. The Liverpool goalkeeper had a terrific first half; making solid saves and another one occurred. 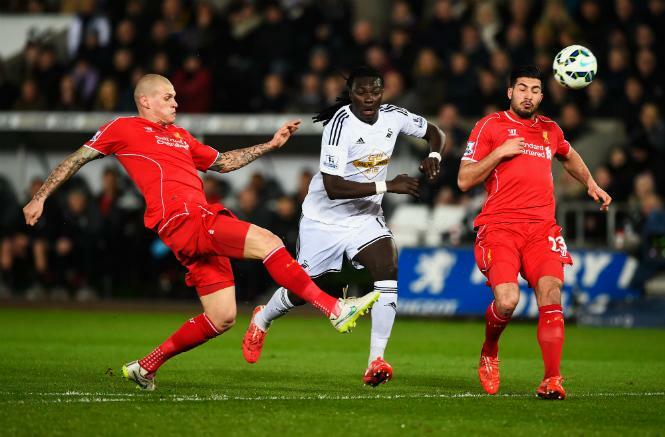 Lallana blocking Gomis' shot only fell to Sigurdsson again who unleashed a terrific curling strike at goal. It was going in until Mignolet impressively palmed away at full stretch. The half time whistle sounded and Garry Monk's men would have been full of confidence heading into the interval. They created many chances, something Liverpool failed to do. Liverpool opened second half proceedings with a more threatening look to their game. Sterling raced down the right wing and cut a ball back into Coutinho centrally, who smacked one at goal only to be denied by more solid goalkeeping from Fabianski; turning his shot around his near post. The Reds had Monk's men pinned back in their own half for the majority of the second half, however they lacked an edge that would bring a much-needed goal and close the gap to Man Utd. Gerrard was brought on for Moreno. 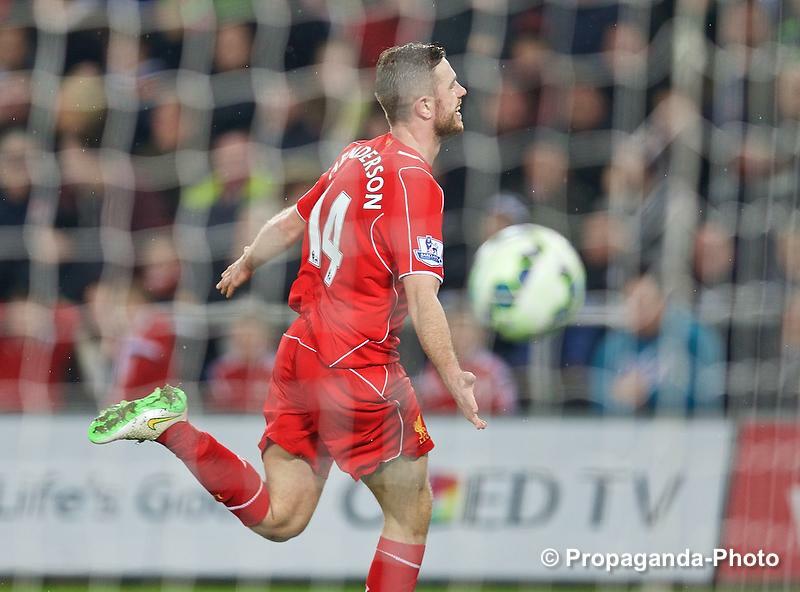 More threatening attacks poured forward from a determined Liverpool side. They were trying all kinds of things to create chances, such as long balls in which one was launched over by Coutinho looking for Sturridge, however the offside flag raised in their disadvantage. Lallana drifted down the left and crossed in towards Allen who got the shot away with no hesitation. Frustratingly for him, it lacked power and to guide past Fabianski as the Swansea man saved well at his far post. Swansea's excellent work in the first half, but no goal to show for was punished by a very, very lucky goal. Sturridge dinked a through ball towards a charging Henderson scampering into the area, however Amat made ground and covered well until a nightmare occurred. The defender's attempted slide-tackled clearance took a deflection off Henderson who luckily watched the ball tumble over Fabianski into the net. Lucky, lucky goal and it was harsh on Swansea but at the end of the day that's football. Following the goal, Liverpool were content just to remain in possession and hold off any Swansea attacks, although they were perched in the home side's half. When Swansea got the chance to break forward and perhaps create a final chance, Shelvey selfishly wasted that with a ridiculous 40-yard strike that blootered over Mignolet's bar. Sturridge would come close to doubling Liverpool's lead, however his smart right-footed low shot clipped off the post as the referee concluded proceedings to a raucous roar from away fans in attendance. 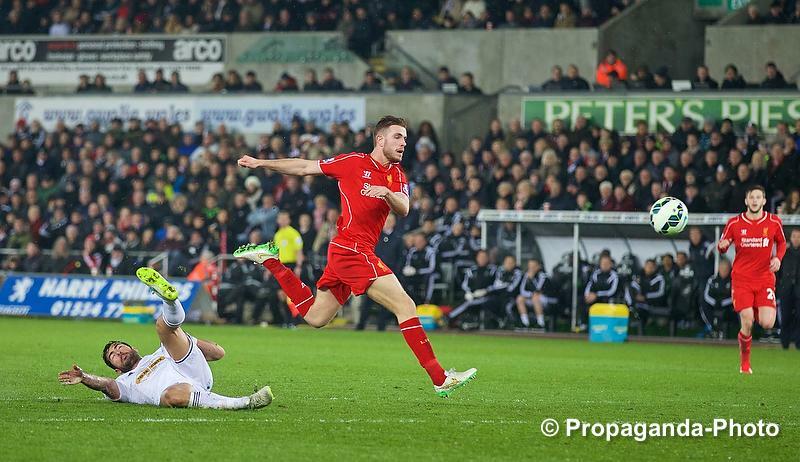 A full match report for Swansea City vs. Liverpool contested on Monday 16th March, 2015.